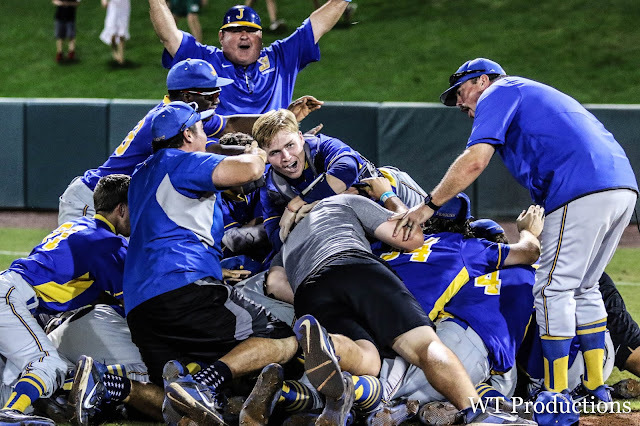 FORT MYERS – Jefferson’s Oscar Galvez said he didn’t know that the focal point of the dog pile is supposed to go down as his teammates smother him. But why should the moments after the Dragons junior lined a game-winning, extra-inning, championship-clinching hit be any different than his two day’s of hitting at the FHSAA State Tournament? 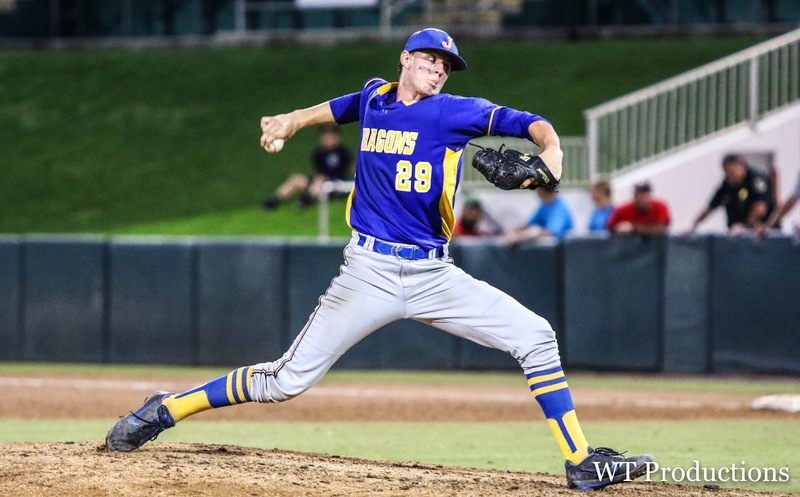 With two down in the ninth inning of Thursday’s Class 6A state final against Merritt Island, Galvez stayed off a 1-1, breaking ball in the dirt and waited for a fastball. 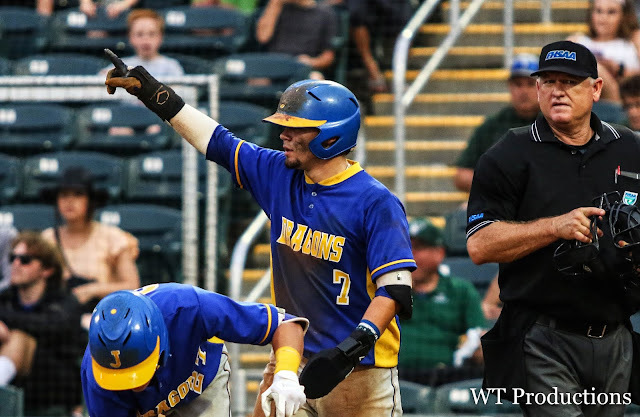 He got just that, and flared it over second base bringing home senior Ty Evans from third, his third single of the game and seventh hit in two days in Fort Myers’ Hammond Stadium (after going 4-for-4 in Wednesday’s state semi) and sealing the Dragons 6-5 win. 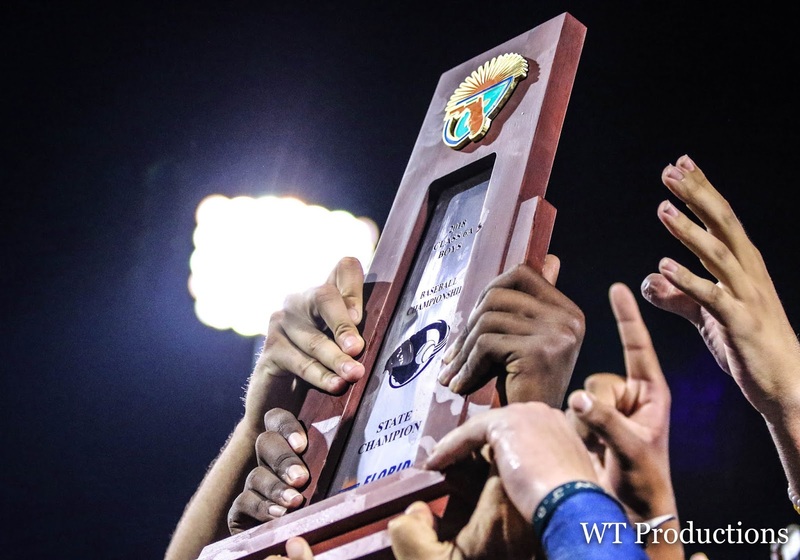 One of the county’s oldest and most storied programs, for 78 years the school that produced Major League Baseball players like Fred McGriff, Tino Martinez and Luis Gonzalez, a state title had proved elusive. Martinez and Gonzalez were members of the Dragons 1985 team, which reached the state semifinals but advanced no further. For Galvez, who said Gonzalez was a baseball hero, the fact that his name could be forever be uttered in the same Jefferson history with a trio of MLB World Series Champions had just started to sink in minutes after the win. After lightning delayed the game’s start for two hours the Dragons took little time getting to work. 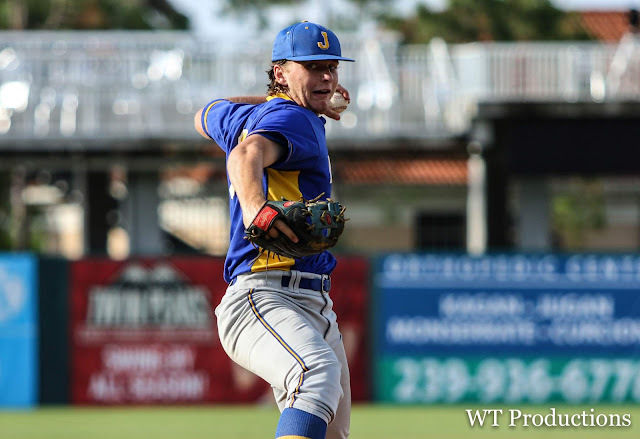 In a moment almost expected of a scout-drawing prospect, Jefferson senior Robby Martin got his team going with a carrying solo-shot over the left field fence in the first inning, and the Dragons took advantage of two Merritt Island errors on the same play later in the frame to take a three-run lead. 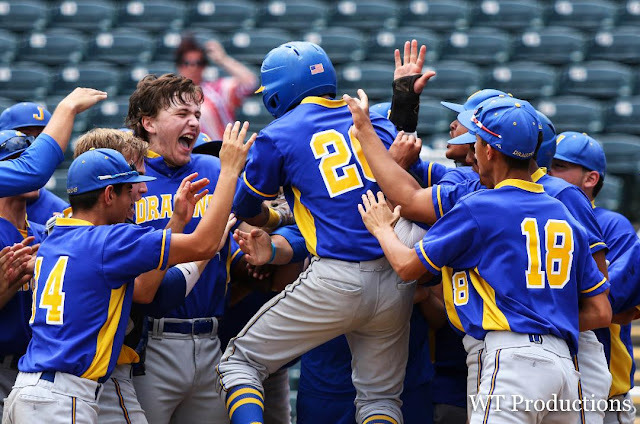 But state championships aren’t won that easily and the Mustangs battled back to take a lead forcing Jefferson to answer and push the game to extra innings. Jefferson (22-8) responded to a Mustangs run in the third by pushing the lead back to three as AJ Mathis punished a drawn-in third baseman, poking an RBI single into left. Merritt Island came to life at the midway point with a four-run fifth inning keyed by RBI hits from Mason Denaburg, Kyle Dentmon and RJ Diaz (two run single) taking a one-run advantage. 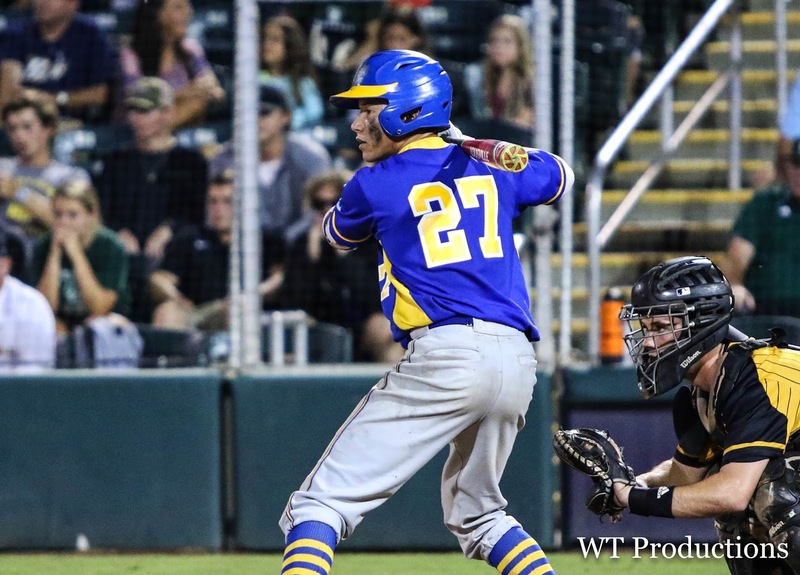 The Dragons answered the Merritt Island rally by tying the game at five when freshman Sal Vega grounded a ball up the middle to plate a run. Dragons lefty Marc DeGusipe worked well through his first four innings, striking out three before running into trouble in the fourth. But despite leaving without the decision on the mound, DeGusipe who transferred to Jefferson this year, with the gold medal dangling from his neck answered a question on if this was the outcome he expected. Martin moved to the mound from right field in the fifth and instantly RJ Diaz singled in two to give the Mustangs the lead. Martin from there was steady working five innings allowing just the lone hit and walking four and earning the biggest win of his career. 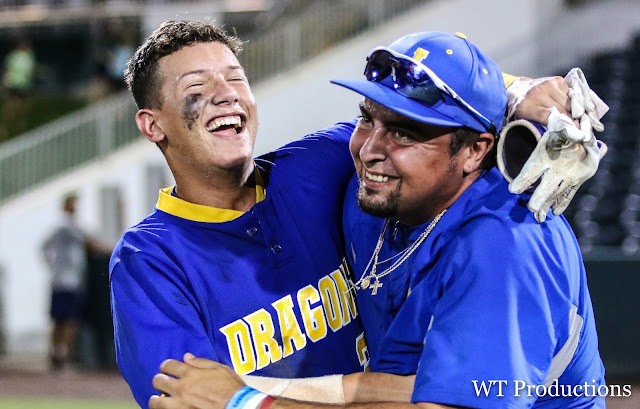 Martin, who has been a four-year starter for the Dragons said the senior-year payoff was worth the wait. Scaglione who served as the team’s coach for the final four wins of the season, along with 30-plus year assistant coach Lou Maggio, and the Dragons other coaches this team has more than honored the legacy of one of Hillsborough County’s oldest programs.